A local startup has a plan to outlast conventional labels: serve more artists by giving them only what they ask for. Colleen Durkin The Audiotree gang. Seated: Chelsea McGrath, Kellen & Me, Michael Johnston, Ira Antelis. Standing: Adam Thurston, Christopher Watkins, Chris "Evil Vince" May, Jon LeClerc. Thu 3/10, 7:30 PM, Lincoln Hall, 2424 N. Lincoln, 773-525-2501, sold out, 18+. The West Loop loft office of Audiotree doesn't give visitors the clearest idea what goes on there. It's obviously a young business, run by young, quasi-bohemian people: the ancient, beat-up hardwood flooring is barely refinished, after the current fashion; the conference room is a floor-to-ceiling glass enclosure, islanded in a larger space; indie-rock concert posters hang on the urban-rustic exposed-brick walls, along with two enormous paintings and a drumhead autographed by all three members of Alkaline Trio. But what sort of business is it? A marketing company? An Internet start-up? A record label? The answer is all three, kind of, and a couple other things besides. "I get that question all the time," says cofounder and director of operations Adam Thurston. "'What is Audiotree?' The best way to describe us right now is that we're a new-concept record label." At the moment the venture is more concept than label. Thurston and his longtime friend, company cofounder and president Michael Johnston—they grew up together in Kalamazoo, Michigan, and are both 27—have amassed a core staff of nine, including social-media coordinator Chelsea McGrath and marketing director Christopher Watkins, though only three work full-time in the office. In November they had a soft launch, going live with the Audiotree website and not telling anybody. But after more than a year of work, they're just now putting out their first release—the debut album by local one-man indie-pop band Kellen & Me. There are no solid plans yet for a second one. The concept behind Audiotree is ambitious and novel, though, and that should interest anyone who still cares about the tragicomedy that is the music business in 2011. Thurston and Johnston don't intend to have a large stable of artists for whom they provide all the many services that record labels historically have: paying for recording, pressing albums, providing tour support, arranging for distribution, licensing, and publicity, and so on. While they plan to sign one or two artists a year to traditional deals like that, for the most part they want Audiotree to act as a kind of cafeteria label for a much larger pool of artists, offering services a la carte—if all a band wants help with is licensing, it can just get licensing help, with no further relationship or obligation. And in another departure from the usual record-label business model, artists not signed to Audiotree will pay up front for what they get. "We have kind of described ourselves as a music-services company," says Johnston. "The idea for Audiotree was to create a place where people could come—like photographers, Web builders, graphic design, bands, whatever, would all come to a website, meet each other, and start working together. They'll just come and there are like ten other people that are doing things that you need and that they need from you." He's describing a possible future manifestation of Audiotree, where people in the company's orbit will in some cases simply meet through its website and conduct business among themselves. This combination social-networking site and job board is still a long way off, but what Audiotree does have already is a team of specialists from several music-biz fields, who work both in-house and out. At the moment a band that wants to record and press an album, design and print T-shirts or posters, have a press release written, or do all of the above can have everything taken care of through Audiotree. Kellen & Me is getting the top-to-bottom treatment because the band's an Audiotree staff favorite and didn't have a label lined up. "However," says Thurston, "there's other bands who we run into who already have an EP or something, so they don't need to record. Or maybe there's a guy in the band who's a Web designer, so he can do all of that. We just want to be able to have that whole Audiotree—the tree of talented people in every facet, whether it's art, photography, booking, and kind of be able to bring all of that together to be able to help bands launch and keep going." 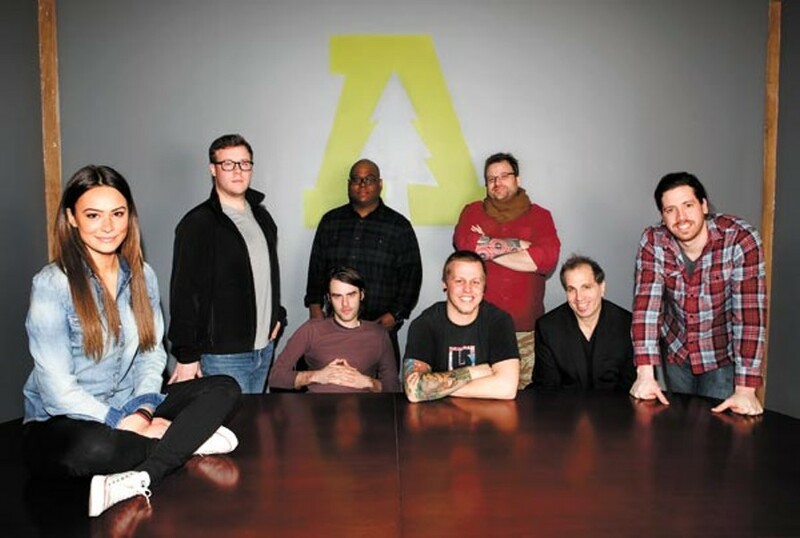 Though the success of Audiotree's iconoclastic vision would seem to depend on traditional music-biz models going extinct—it's hard to imagine too many artists opting to pay for label services if they can still hope to get signed the old-fashioned way—its staff includes folks with long histories in the industry. Johnston and Thurston were educated very much within the system, and have degrees from Full Sail University near Orlando, Florida, which specializes in entertainment and media: Johnston's is in recording engineering (he's spent about five years freelancing for Chicago studios), and Thurston's is in "recording arts and music business." Johnston and Thurston have also benefited greatly from their association with 30-year industry veteran Ira Antelis, a music supervisor for ad giant Leo Burnett who composes both commercial jingles and serious musical-theater pieces. The partners met him through the lawyer who was helping them establish Audiotree as a limited liability company, and Antelis was interested enough in the project to get involved—he now owns a percentage of the operation and contributes his expertise in a mostly advisory role. He's a large part of why the core Audiotree team includes Rick Fritz, an engineer who's worked with Brian Wilson and Beyonce, and Chris "Evil Vince" May, who's managed merchandise for Ben Harper and Coldplay. Antelis credits the dismal industry climate for bringing major-label-level talent to a start-up that despite attracting a couple of investors is still largely funded by Johnston's savings. "The big labels, I think they're stuck five years behind," he says. "They look at something that happened and it takes them five years to catch up. I think Michael's vision has always been, How are we going to do something that no one's doing? And I think it's happening." Of course, for Audiotree to take off, it needs to attract musicians, not just staff. Right now the company is still in the red, without any paying customers, and has been raising money selling T-shirts. Thurston and Johnston hope to scare up clients with an enterprise they're calling Audiotree Live, which they run with help from Kellen & Me manager Jon LeClerc: They record musicians in Antelis's studio in the Leo Burnett offices (he offers them a discounted rate), with Fritz behind the controls and May conducting short interviews between songs, and then post the finished product on their site. The artists get to keep the recording for free, and Audiotree attempts to license the songs, splitting any proceeds 50-50. "The cool part," says Johnston, "is that we brought in one band, and they were so happy, and they told their label, so their label gave us like three other bands." 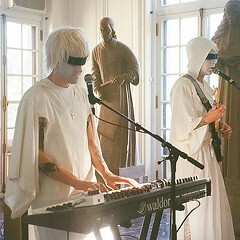 So far Audiotree has conducted 28 sessions, beginning in September so its website would have some content for its soft launch; 20 have been filmed for a related feature, Audiotree TV. Overall it's roughly the same thing Daytrotter is up to in the Quad Cities, except that Audiotree runs one or two sessions a week on average, not one or two a day—and of course that's all Daytrotter does, while Audiotree has about a hundred other things on its plate. Johnston says it suits him to test his limits by taking on all these projects. "I'd rather be scared," he says. "I'd almost rather be worried when I wake up in the morning or at night." That said, he's hardly reckless. "I don't ever want us to spread ourselves too thin, and we don't ever want to overpromise and underdeliver." He doesn't seem to think Audiotree is in any danger of underdelivering, because he's still coming up with new plans. Eventually, he hopes, the company will tape enough live sessions to fill a TV channel. "We want to do an Audiotree tour around the country," he says. "And we want to do festivals."